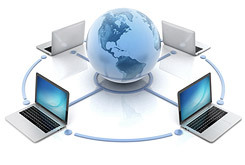 iT1 Solutions offers a variety of advanced wireless services including campus-wide, point-to-point wireless networks as well as smaller, secure wireless networks. We can even help you set up a Wi-Fi hotspot for your guests. We provide comprehensive wireless services, beginning with gaining an in-depth understanding of your wireless needs and goals. Our consultants work closely with you to learn about your business and your wireless requirements. We then conducts site surveys and recommend wireless solutions that align with your organizational strategies. Once the wireless plan has been thoroughly developed and fleshed out, our team gets to work. We are able to handle all aspects of the implementation including design, parts procurement, installation, configuration, security, and support. Our wireless services are appropriate for small, medium, and enterprise businesses. Whether you need a small, secure wireless network for a branch office or a complete, campus-wide, point-to-point installation for your company headquarters, we have the wireless networking expertise and talent to get the job done correctly and securely. iT1 Solutions is committed to remaining on top of the latest wireless innovations. Whether you’re interested in in-building cellular amplification, outdoor bi-directional amplification, Wi-Fi, microwave, Bluetooth, wireless wide area networks, 3G and 4G networks, municipal wireless Wi-Fi mesh zones, or any other wireless services, we're here to help. As with traditional LANs and WANs, wireless networks must be properly secured against hackers, computer viruses, spyware, and other threats. iT1 Solutions specializes in creating secure wireless networks and can help you make the best choices to protect, monitor, block, and recover from intrusions. We're committed to helping businesses of all sizes leverage the latest technologies, including wireless, to their full advantage. Contact us today to learn more about our array of advanced wireless services.